According to a new study by Payments UK, the number of contactless payments made last year were three times those made in 2014. The UK Cards Association reported that in March spending on contactless cards surpassed £1.5bn for the first time. One in seven transactions is now contactless, compared with one in 16 a year ago. And on the high street, one in six purchases is contactless. This is certainly a trend that charities cannot ignore and it has not gone unnoticed by the sector. The Royal British Legion was an early adopter when it trialled contactless donations in 2013 for its Poppy Appeal, giving people in Birmingham the option of giving by tapping their cards on posters and tins. In 2014, Penny for London was launched. Under this scheme, Londoners are encouraged to donate a penny or more each time they use their Oyster card to travel. Since then, more charities have been testing the waters of tap to give. Holly Spiers, director of fundraising and hospices at Sue Ryder, says that charity has wanted to try tap to give for a while. "With physical locations such as hospices and shops, along with well-attended events, we saw an opportunity to see if this is something that could work for us," she says. "As more people make contactless payments, it makes sense to offer this to supporters so they can give in a way that suits them." 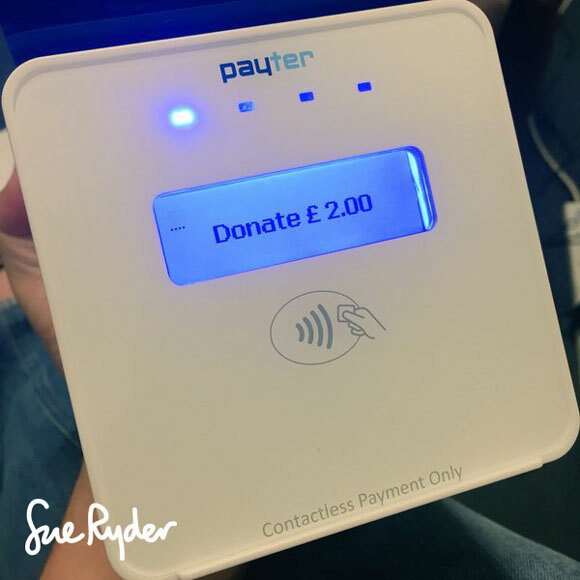 The charity recently began a trial at its Sue Ryder Nettlebed hospice, where it is testing two contactless devices – a hand-held device and a static device that is secured at the hospice reception. "We’ve produced supporting materials to explain what the device is and how it works, and we've talked to staff so they feel confident in explaining to visitors how they can donate," says Spiers. "This static device lets people donate £16, which might seem high, but actually equates to the cost of an hour of care in one of our hospices. It's a tangible ask in a setting where people know who we are and about the care we provide. This device replaces the cash donation box that used to sit in the same place. "In terms of the hand-held device, the Sue Ryder Nettlebed hospice hosts sales every three weeks that are attended by about 1,500 people. We will be taking the hand-held device to the sales, talking to people about our work and encouraging them to donate. This device will let people donate £2 each time they tap. Because it's portable, we can take this to many other events we know will be well attended and use it alongside our cash donation buckets." The charity will be monitoring the trial closely, looking at how it performs according to various measures of success. If it is successful, it will look at putting similar plans in place at its care centres across the country. "There's also the potential to use devices in some of our 458 charity shops," says Spiers. "We have the ability to alter the amount of each donation too, so we can see what works best for us and potential donors." The animal welfare charity Blue Cross has taken an approach similar to that of Sue Ryder with its Tap Dogs initiative. It has taken its contactless devices to events embedded in specially designed dog jackets. People can simply pat dogs with their contactless cards to make donations. The idea came from the charity’s PR agency, and the Blue Cross fundraising, marketing and communications team developed the concept. After about two months it was ready to trial the initiative at events in May. 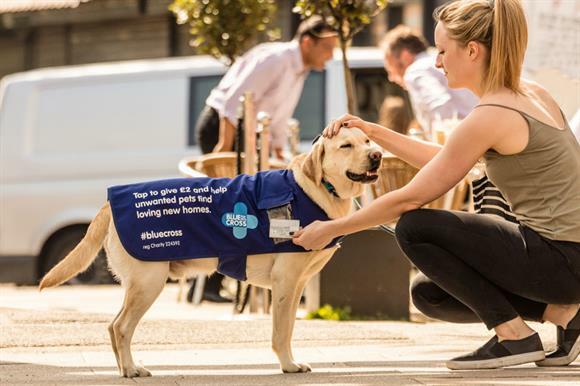 Julia McKechnie-Burke, director of fundraising, marketing and communications at Blue Cross, says it is too early to gauge how successful this form of giving is compared with more traditional methods, but says early results are promising. "This initiative is both about increasing awareness of our charity and raising funds in a fun and innovative way," she says. Cancer Research UK trialled contactless donations in four of its charity shop windows for World Cancer Day in 2015, then launched contactless collections for World Cancer Day 2016. The collections took place in 16 locations across London, Glasgow, Liverpool and Leeds, making CRUK the first charity to trial contactless donation technology on this scale. Supporters had the opportunity to donate £2 to the charity by tapping their contactless cards on a specially designed reader, operated by their fundraising volunteers. Paul Weaver, digital innovation manager at the charity, says the move was in part a reaction to people carrying less cash. "It's still early days in terms of contactless giving as a normal behaviour within the sector, so we’re working with the UK Cards Association and a number of charities to raise awareness and increase the scale of contactless giving," he says. "We’re also openly sharing our learning across the sector. "With the increasing use of contactless and the decline we’re seeing in cash usage, contactless giving is a natural next step, and we’re excited to see how it develops." As Weaver says, tap to give is a fairly new concept in the sector, but it’s promising to see charities start to experiment with this technology and even better to see that they are sharing and learning from each other. Analysis: Is bitcoin the ideal charity currency or a cause for concern?